Prior to the official proclamation of Queensland's borders in 1859, a number of interesting suggestions were put forward concerning borders. For a brief period of time one suggestion was acted on, with a colony of North Australia being established in 1846. By 1838 the coastline of the Australian continent had been well defined by mariners such as James Cook, Matthew Flinders and Phillip Parker King. As for the interior of Australia, little was known except for the area south of a line from Moreton Bay to Victoria as it is now (i.e. the south east of the continent). This knowledge had been obtained from the journeys of explorers such as John Oxley, Charles Sturt, Thomas Mitchell, Allan Cunningham and George Evans. 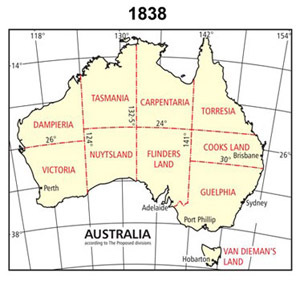 There were many proposals for the subdivision of the Australian continent dating back to the 1830s. This proposal by Captain James Vetch was published by the Royal Geographical Society in their journal of 1838. Vetch tried to give each colony equal areas, possess a tract of sea coast with possible harbour sites and be as compact as possible. The boundaries of his proposed colonies were defined using lines of latitude and longitude. This was generally used by colonial administrators when there was either no natural features such as rivers and ranges or due to exploration of the country not being well enough advanced to know if there were any natural features. The loss of the American Colonies due to the War of Independence (1775–83) forced the British Government to find another place to send its convicted felons. Its most recent acquisition (1770) New Holland (Australia) was chosen and the first penal settlement established at Port Jackson in 1788 by Captain Arthur Phillip. Other settlements soon followed, Norfolk Island, Van Diemen's Land, Port Macquarie and in 1824 Moreton Bay. In 1840 the transportation of convicts to New South Wales ceased although Van Diemen's Land continued to receive large numbers of convicts. When William Ewart Gladstone became Secretary of State for the Colonies in 1845, he was confronted with the problem of the large numbers of pardoned convicts roaming around Van Diemen's Land unable to find work. Rather than revive transportation to New South Wales (which he knew would be very unpopular) he decided to create a new colony in the northern part of New South Wales. To this new colony he proposed to send the pardoned convicts of Van Diemen's Land and he hoped that in time they could form the backbone of a new vibrant free colony. 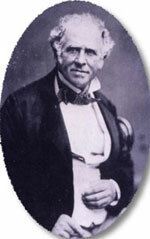 In May 1846, Lieutenant Colonel George Barney of the Royal Engineers was chosen as the new colony administrative head. He was soon despatched to Sydney and instructed to find a suitable site to the north of Moreton Bay, but not that far north that the tropical climate would have an adverse effect on the health of the settlers, preventing them from hard work and industry. Port Curtis (Gladstone) was chosen. Also in the same month the official Letters Patent were issued by Queen Victoria forming a new colony to be called North Australia. The southern boundary of this new colony was to be 26 degrees of south latitude. On 8 January 1847, the Lord Auckland sailed from Sydney with the new colonial officials and their families arriving at Port Curtis on 25 January 1847. On entering the port the Lord Auckland grounded on a shoal. The officials quickly headed for shore and a few days later, the official swearing in of Lieutenant Governor Barney and his officials took place. In July 1846, back in Britain, the Government had changed and Earl Grey had replaced Gladstone as Secretary of State for the Colonies. The new government had decided to abandon the new colony and advised the Queen to revoke the Letters Patent. This decision took many months to reach the Governor of New South Wales and some more time for Sir Charles Fitzroy to transmit the despatches to Barney ordering the abandonment of the North Australia colony and the return to Sydney. The officials had endured 4 months of indecision, rain, heat, and mosquitoes before they returned to the civilisation of Sydney where they arrived in May 1847. No pardoned convict ever reached the new colony. In 1823, John Dunmore Lang (1799–1878) a Presbyterian clergyman, politician, immigration organiser, educationist, journalist, patriot and statesman arrived in Sydney to take up his ministry. Lang soon realised that the poverty he left behind in Britain could be relieved to some extent by emigration to Australia, feeling that a well-off protestant peasantry would reduce the problems of English industrialism. To this end he was always looking for suitable new areas and country away from the problems of Sydney and Hobart. In 1845, Lang visited Moreton Bay and was so impressed that in 1848 he persuaded about 270 immigrants to come to Moreton Bay. Lang's promise of free land in proportion to their passage money was not realised due to colonial bureaucracy and his scheme failed. In the years 1847–49, while visiting England, Lang wrote a series of letters to Earl Grey (Secretary of State for the Colonies) recommending that a new colony be created out of New South Wales to the northward of 30 degrees of south latitude. The home government must have been influenced by Lang’s proposals as in 1851 they passed an Imperial Act, the Australian Colonies Government Act, which contained a clause (Section 34) which allowed for that to be it at some future date. In 1856, the Secretary of State for the Colonies announced that it was their intention to create a new colony whose southern border line would run not far to the south of 30 degrees south latitude but would be accommodated to suit the natural features of the country. During the next few years strong debate ensued, petitions for and against (from both the squatters and merchants in the proposed border area) were sent to the Governor of New South Wales, Sir William Denison as well as the Secretary of State for the Colonies in Britain. Lang kept agitating for his colony 'Cooksland' where he hoped to settle yeoman protestant farmers who would grow crops of cotton and sugar. 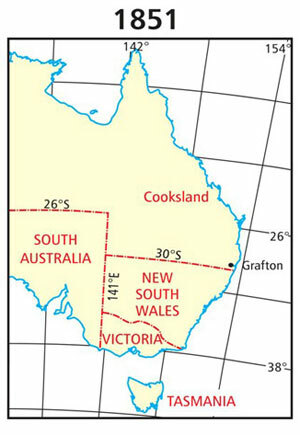 The considerable influence of the New England and Armidale squatters was to greatly affect the location of the border. They feared that if they were to be located in the new colony then their power base, which was in the Sydney Parliament would be eroded. 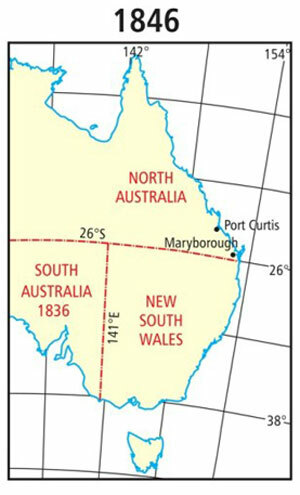 By 1857 Denison had made his recommendation to the home government for a border starting further north along the coastline at Point Danger (about 28 degrees south latitude).